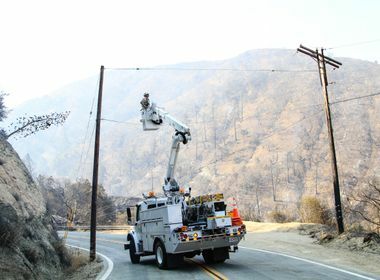 SCE crews work to restore power in areas devastated by the Sand Fire. 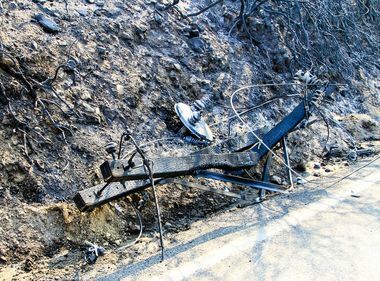 SCE crews also face snakes, bees and high temps amid the Sand Fire devastation. UPDATED, July 29 at 11:00 a.m.
It’s 5 a.m. and Jim Meis’ day has already started. Soon, he will leave his Moorpark home for Santa Clarita to join the rest of Southern California Edison’s crews who are working to restore power to areas devastated by the Sand Fire. 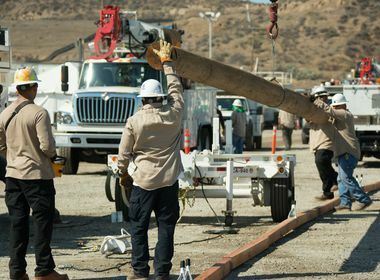 As a district manager for Valencia, seven of his crews have joined 21 other 5-man crews from SCE’s eight regions to work this wildfire. Wednesday, the crews set 27 new poles and 20 spans of wire. Thursday’s goal is to dig 17 holes in remote regions in preparation for SCE’s helicopters to set new poles. The Sand Fire has so far consumed more than 38,000 acres and destroyed 18 structures. The fire is now 85 percent contained. In the fire’s wake, more tha 245 poles have been damaged or destroyed. That number is expected to increase as final assessments are made. Currently, 55 customers have no power. On Tuesday, first responders gave the OK for SCE crews to enter some areas to start power restoration efforts. The crews had been anxiously waiting to get started. The days begin early for the crews who work 16-hour shifts. A safety briefing at 6:30 a.m. lays out the details for that day’s work. They also discuss the hazards involved in working such a remote area, including temperatures as high as 104 degrees, bees and even snakes. So far it looks like it will be several more days before all power is restored to the devastated area. The crews were able to get 25 customers restored Thursday evening. They also hope to soon get a decision on whether SCE’s helicopters can enter the air space to begin replacing poles. Meis has worked for SCE for 28 years, several of those as a groundman and lineman himself. He knows the difficult task the crews face as they work this wildfire restoration. His guys also have a lot in common, he said, like a love of the outdoors and high mechanical abilities, a necessity with this type of work.